Samsung is still reeling in the aftermath of the its decision to kill off the Galaxy Note 7 device. The South Korean company is now reported to have rushed the initial decision to launch the first recall of the Galaxy Note 7, one that may now have proved to be the fatal mistake that led to the demise of what was once a very promising device. According to a report from the Wall Street Journal, after the first incidents of Galaxy Note 7 devices catching fire came in, the South Korean tech giant‘s executives debated the proper response to the situation. According to the article’s sources, some executives were skeptical that the incidents were more than just isolated cases, and others believed that the company should act swiftly regarding the matter. “That decision in early September—to push a sweeping recall based on what turned out to be incomplete evidence—is now coming back to haunt the company,” reports the Wall Street Journal. A lab report showed that some of the faulty devices contained batteries that showed bulges in CT and X-ray scans. These batteries came from one of the company’s affiliates, Samsung SDI. Batteries from other suppliers did not show this same issue when tested. Additionally, Samsung was found to have self-tested the Note 7 batteries using on-site testing facilities. Apple and other smartphone manufacturers make use of third-party off-site facilities to test their batteries. Although the evidence was considered incomplete, Samsung decided to pull the trigger on the recall for over 2.5 million units. 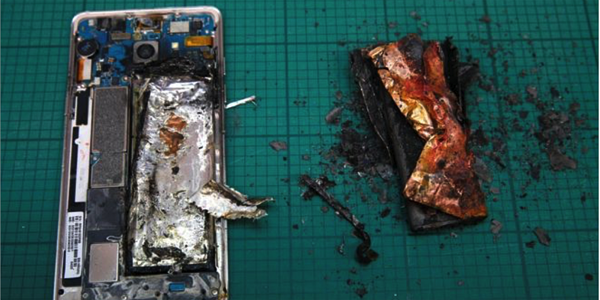 Later, replacement units also caught fire, which led to the company completely killing production of the device. Had Samsung taken the time to get to the bottom of the issue the first time around, would the Galaxy Note 7 still be around? I guess now we’ll never know.